OUR ROOTS AND OUR PROUD TRADITION. The year was 1939. The film “Wizard of Oz” opened in New York City, the first U.S. food stamps were issued, and baseball legend Lou Gehrig was forced to quit baseball due to illness. And in the same year that Britain and France declared war on Nazi Germany thus marking the beginning of World War II, progressive-thinking labor officials founded Local 495 and chartered the union to organize worksites automotive in nature. The Local’s first Secretary-Treasurer was union veteran Frank Hatfield, Sr. whose focus and enthusiasm helped 495 become one of the strongest and most recognized locals in the west. He quickly began organizing parking attendants in Los Angeles branching out to restaurants, valet services, and the many downtown lots. The visionary also hit the California racetracks and organized all of the parking personnel. During the 1940’s under Hatfield’s watch, Local 495 expanded and began organizing employees working in the automotive industry – gas station attendants, repair shops in the trucking industry, rock and gravel, and workers in the food, bakery and dairy industries. In 1952, and roughly 4,000 Teamsters strong, Hatfield hired Karl Ullman, a young parking lot attendant with a passion for the union whom Hatfield knew would make an outstanding business agent. Twenty-years later, Ullman would become the Local’s second Secretary-Treasurer when Hatfield retired. Throughout the 50s a number of Teamster locals merged, jurisdictions changed and members were chartered out of 495. Late in the decade, Local 986 emerged and many parking attendants were moved under their jurisdiction. Members in the automotive industry also were affected. A new charter cut right down Rosecrans Avenue – anything to the north was Local 495, anything to the south was Local 88. But 495 was an organizing Local. Although three or four groups were charted out of the Local, the union pressed on and soon began representing the porters, truck washers and parts handlers at UPS. In 1955, the Western Conference Teamster Pension Plan was established adding a tremendous benefit to being a member. The Local’s organizing successes continued into the 1960s when union officials reached out to represent members on the manufacturing side of the automotive industry. Tire re-treaders, break shoe makers, and engine re-builders all found themselves working under the Teamster banner. The decade also saw the first establishment of the Teamster health and welfare plan that, at the time, only provided medical benefits for members and their families. In the early 60s, Ullman became President of Local 495. During his tenure, he built a foundation cementing in key contracts. He was the architect of the Hertz Western Master Garage Agreement, the Southern California and Southern Nevada Ryder Truck Master Agreement, and the draftsman of the Hertz Western Truck Rental Agreement covering mechanics and service personnel. This expertise lead him to be the spokesman for anything having to do with the automotive trades in the Western Conference and chief automotive negotiator for all Teamster locals in the western states. Local 495 continued to expand its jurisdiction during the 60s adding employees in the car rental industry. The first to organize was Hertz, then Avis and National, which was followed by employees in the truck rental industry. Dozens and dozens of industries were added in the 60s. The Local organized distribution centers, battery plants and automotive parts warehouse facilities, and drivers and garage employees in the linen industry. And another Hatfield joined the ranks when Frank Hatfield, Jr. started working as a business agent in 1964. The decade also saw the birth of dental, prescription and vision plans for families. Naturally, the Teamsters were instrumental in this significant development. HMO’s provided by Kaiser developed during the 60s and it was an ideal match: if a member chose Kaiser, union nurses and medical personnel in those facilities were treating them. At one time, half of the Local was made up of auto aftermarket manufacturing members, but by the 70s the Local’s effort to expand its organizing efforts helped diverse the union into manufacturing employees of all kinds. The start of a new decade also meant a change in leadership when Frank Hatfield, Sr. retired in 1970 and Karl Ullman was named Secretary-Treasurer. In 1973, a young Marine fresh from Vietnam who had bounced around several dead-end jobs joined the rank and file when he began working at Cal-Custom Auto Parts. One month after getting the job, Bob Lennox – whose father had organized the shop by finding Local 495 in the phone book – became the shop steward after his father stepped down from the post. Three years later, Lennox joined the local as a Business Agent. The Local was boasting a membership of roughly 6,000 signifying a broad, cross section of groups. But the era came with double-digit inflation and wage freezes. When contracts were negotiated, members were receiving a $1.00 an hour pay increases but were finding it difficult to keep up financially. By the 80s, Local 495 had diversified and was continuing to prosper. In January of 1986, Local 88 merged back in with 495 when that local’s longtime Secretary-Treasurer Lee Dahlenburg retired. This merger boosted the 495 membership to its peak of 10,000 members. In 1987, Lennox was elected President of Local 495 – a time when the late 80s saw the demise of manufacturing that was accelerated when NAFTA went into effect. The Local also lost thousands of members over the course of several years when technology began replacing workers or manufacturers simply left the area. Yet, the Local was able to weather a serious recession and tough economic times because the membership was employed in so many different crafts. While other locals failed, Local 495 remained versatile and resilient. In 2000, Local 495 launched it’s first Scholarship Awards Program, which started out at $1,000 per student benefit and as of 2015 has been increased again to $2500.00 per student. The dawn of a new millennium brought the addition of hundreds of new members working full and part time, as well as seasonally, when Disney’s California Adventure opened in Anaheim. Both business and labor also began the new century struggling with escalating health care costs. Once a given in negotiations, unions across the country began lengthy bargaining sessions to preserve benefits that, ironically, were pioneered by the labor movement. In 2006, a milestone was marked in the Local’s history: Longtime Business Agent and union activist Rigo Tirado was named to succeed Walker as President making Tirado the first person of Latino decent to hold the position. In 2012, with the retirement of Tirado, long time business agent George Park was elected to serve the growing membership of our diverse union. George brings a tremendous amount of experience in all areas of Local 495, and is also one of the Local’s primary negotiators. 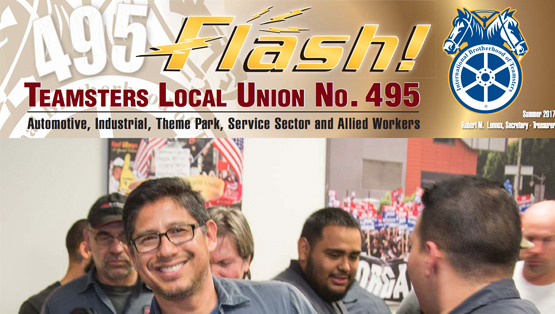 Another landmark was achieved in 2014 as Local 495 celebrated it’s 75th Anniversary. Today, membership peaks at roughly 9,000. More importantly, the Local’s 75 year-old foundation of organizing non-union workers, securing fair and equitable labor agreements while providing outstanding representation, has never wavered. The Local is proudly staffed by a dedicated group of officials, six Business Agents and resourceful office personnel all working for the betterment of the entire membership.